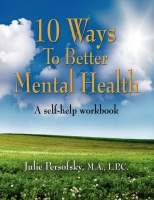 This workbook offers coping skills to improve your mental health. 10 Ways to Better Mental Health is a self-help book offering coping skills to improve your mental health. The skills and strategies you will learn will help you deal with depression, panic attacks, anxiety, sleep problems, fear, stress, anger, pain, obsessions and compulsions, nightmares, and flashbacks. Each chapter begins with a short description of a person with a mental health problem and how the problem was addressed. The rest of the chapter teaches skills and strategies to deal with similar problems. It is interactive with questions about your particular issues and it provides space for you to write in answers. Some topics covered are stress management, anger management, changing negative thoughts, relaxation techniques, and assertiveness. A recommended reading list and a list of internet resources, e.g. support groups and further information about mental health topics are included at the end of the book. Julie Persofsky is a licensed professional counselor in Pennsylvania. She earned her masters degree in clinical counseling psychology from La Salle University. She works as a therapist in Ft. Washington, PA. She helps clients deal with mental health issues such as depression, panic attacks, fear, stress, and anger.